There were no medals for the orthotists, prosthetists, and other lower extremity specialists in attendance at the 2012 games in London. But thousands of world-class athletes couldn’t have succeeded without them. If you treat overweight patients with hip or knee osteoarthritis, you’ve undoubtedly counseled them about the benefits of exercise and maintaining a healthy weight. They’ve probably told you how much they really would like to exercise, if only the pain weren’t so bad. 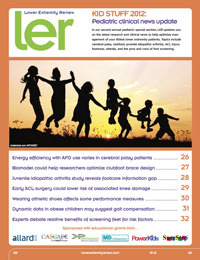 In our second annual pediatric special section, LER updates you on the latest research and clinical news to help optimize management of your littlest lower extremity patients. Topics include cerebral palsy, clubfoot, juvenile idiopathic arthritis, ACL injury, footwear, obesity, and the pros and cons of foot screening. Ankle foot orthoses (AFOs) are regularly prescribed to children with walking disabilities resulting from cerebral palsy, yet the effects of AFOs on energy recovery and work during gait are still unclear. A surrogate biomodel of a child’s lower extremities, in particular the ability to model movement along multiple axes of rotation, could help improve researchers’ biomechanical understanding of bracing for clubfoot. A Scottish study suggests foot care in children with juvenile idiopathic arthritis (JIA) falls short because of poor access to care and negative perceptions about custom foot orthoses. Experts say those issues may be less prevalent in the US but emphasize the need to educate patients, parents, and referring clinicians about the benefits of lower extremity care. Timing of reconstruction surgery after pediatric anterior cruciate ligament (ACL) injuries seems to be related to the prevalence of meniscal and chondral injuries discovered during those surgeries, according to new research published in the September issue of The American Journal of Sports Medicine. Research has recently begun to clarify footwear’s effects on gait and functional performance in children, but the broader implications of the findings remain a matter of debate. An Austrian study exploring the role of genu valgum and flatfoot in obese and normal weight children found obesity was associated with higher peak plantar pres­sures, but lower maximum force while walking, when forces were normalized to body weight. Despite being upheld by the Supreme Court, the Affordable Care Act remains a subject of debate heading into next month’s presidential election. Meanwhile, government affairs experts are working to determine just how the ACA will affect lower extremity practitioners. Research suggests that the ankle’s ability to absorb its share of energy during landing from a jump is altered with the use of an ankle brace. The extent to which this effect might influence risk of injury to other lower extremity joints or soft tissues, however, remains unclear. There are few high-quality studies and no randomized controlled trials documenting its effectiveness, but debridement—from surgical to larval—remains a mainstay of diabetic ulcer care in many practices, and new twists on conventional techniques continue to evolve. Prehabilitation, particularly in the form of exercise, has the potential to significantly improve preoperative and postoperative outcomes in patients with knee osteo­arthritis who are undergoing total knee arthroplasty. Both physiological and psychological outcomes can be positively impacted. Brains and sprains: Is there an extremity-concussion link? The sports medicine community is demonstrating increasing interest in the possibility that neurocognitive impairment and musculoskeletal injury may be related, as evidenced most recently by an exchange in the letter to the editor section of the September issue of The American Journal of Sports Medicine (AJSM). Knee and ankle sprains in National Football League (NFL) players occurred more frequently on artificial turf than on grass between 2000 and 2009, according to a study commissioned by the NFL Injury and Safety Panel e-published in September by The American Journal of Sports Medicine. Swiss researchers have found that pedobarographic differentiation between ankle arthrodesis patients and healthy volunteers can be narrowed down to a single variable, midfoot index of load—a finding that could make the technology much more accessible to the average clinician.